On the first day of winter, June 1st, I had just seen Grant off to work and I had a lovely surprise. 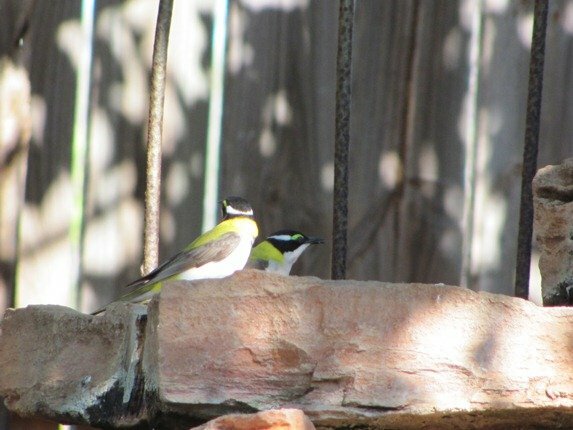 One of our watering points in the garden had a family of Black-chinned Honeyeaters at it. 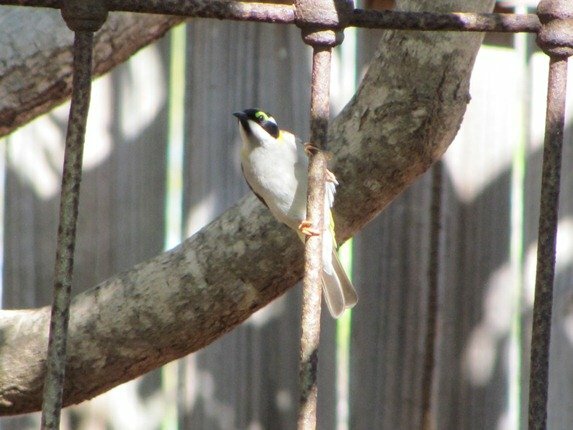 I raced inside to get the binoculars and camera, because from a distance you need to confirm that you have not got White-throated Honeyeaters-especially if they are not being vocal. It was lovely to see the two adults and two juveniles bathing together and then drying off before leaving. I was excited as we had already had a good start to our new “weekly garden list” with a Sacred Kingfisher on our pretend powerline as the sun came up. I looked back through our records, which go back to the winter of 2000 and during 2005 we had a pair visit regularly from May to October. There were no sightings during 2006, but that means we did not see them and they may well have visited! There was only one visit in 2007, but they were seen occasionally during the following 4 years. They generally acknowledge their arrival with a distinctive shrill sound, but they were silent on this occasion and it was the first “family” visit. I had no luck with photographing the juveniles, but had managed to photograph one of the parents as they preened after bathing. They are distant photographs and it shows how well they can hide in the foliage. When Grant got home he reminded me that in all the excitement of adding them to the “weekly garden list” I had overlooked my 2012 list! This was bird 259! It was the first day of June, so we all have only 7 months left to add to our 2012 list…but I can see this going for a few more years yet! Some of us have been overseas once so far and others are constantly on the move! 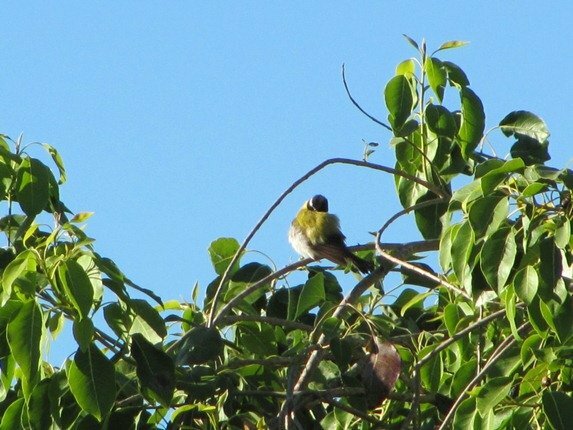 The following morning there was a repeat performance of the Sacred Kingfisher on the pretend power line and then the Black-chinned Honeyeater family were in earlier, so Grant saw them before work. On Wednesday I was positioned between the two watering points in our garden watching all of the birds bathing and drinking in the heat of the day. I turned to look at the second and they were back! 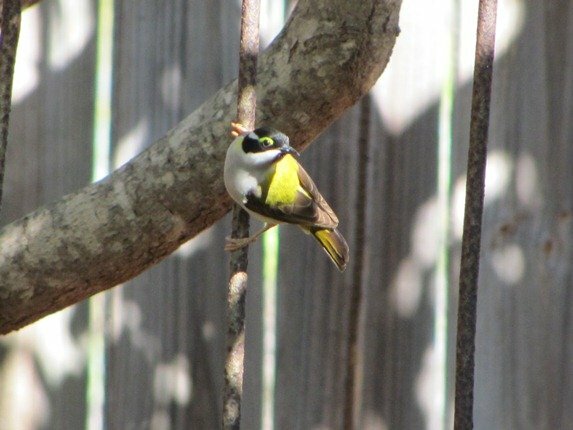 They were quiet once again and that is not very helpful to the observer facing the other way…but I did get some rather nice photographs showing the colours of this beautiful honeyeater. Once again I only managed to photograph the adults and the juveniles have less subtle colouration. 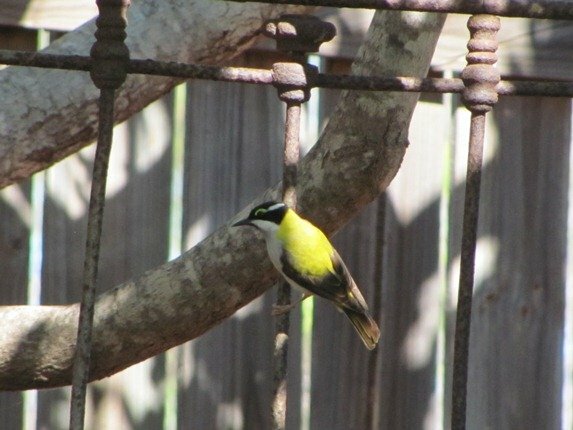 In case you are wondering about the metal uprights that the birds love to hang off….it is a very old single bedhead frame that we found in the Goldfields region of the outback about 20 years ago and thought we should rescue for a future garden that we may one day have! The knob in the top of the first of the above three photos was the original tension for the base of the bed. 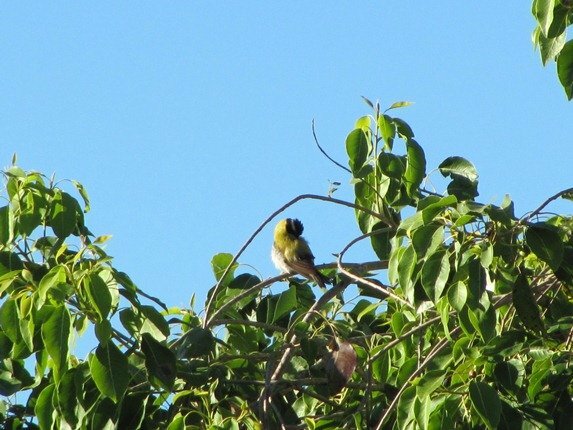 It has been a huge success with the honeyeaters and they drop from the tree onto it and then enter the water. What a gorgeous bird! I also love the history of the bed frame, a most unusual garden ornament and just perfect for the visiting birds! Admit it: you have painted their backs with yellow/neon text markers! That can’t be their real, natural colouration! The “eyebrows” are pretty good too!